March has always been one of my favorite months, because it is both an ending (so long winter don’t let the door hit you on the way out) and a new beginning (spring! grass! birds chirping!). For many happy runners it is also the beginning of a new race season, and accompanying training plans. It certainly is for me this year, and I’m very excited! As I was planning out my March calendar last night I realized I actually have 4 fun races planned for the month. I am running two from the Will Run For Beer series – the Smutty Palooza 5k, and the April Fools 4miler. I will also be doing the Nutty Irish Run in Salem MA, and the Millennium Shamrock Shuffle. I have never run any of these races before, and am really looking forward to all of them. I will be sharing my experiences in future blogs, as the month goes on. In addition to running 4 races this month I will officially be starting my half marathon training. I am training for both Wallis Sands and the Boston Run To Remember – which take place one week from each other and will earn me my Half Fanatic number. My last half was Smuttynose, in October. While I have kept running and racing since then I’ve kept my mileage down. My longest run was 6 miles at an easy pace. Most weeks I have not exceeded 9 miles. I’ve really enjoyed my down time but some days it’s felt a bit aimless. I’m excited to start building my mileage back up, working on my speed, and challenging myself to my New Years goal of a 2 hour half. Like most New England runners (and most New Englanders in general) I am so ready to bid winter a farewell. Yes, I’ve enjoyed some gorgeous snowy runs. And there’s an amazing sense of accomplishment to working up a sweat when it’s below 20 degrees out. Something exhilarating about breathing in that cold air and feeling the ice crunch under our yak trax.. But I’m done. I’m ready for running on pavement. I’m ready for running in short sleeves! I’m ready for sunshine and budding trees. But while I am rooting for March to keep it’s promise of in like a lion out like a lamb (and yes it is snowing as I type this) I am rooting for myself to do the opposite. I am easing into March as a relaxed and comfortable runner who has taken things pretty easy these past few months. Similiar to a gentle lamb. And I’m planning to go out with 4 new races under my belt (where I have hopefully gotten times I’m proud of) and steadily increasing mileage. I’m hoping to feel strong and powerful (and probably quite hungry) when this month comes to a close. Like a lion. When my alarm went off this morning I was not enthused to climb out of my cozy warm bed and into the cold outdoors. 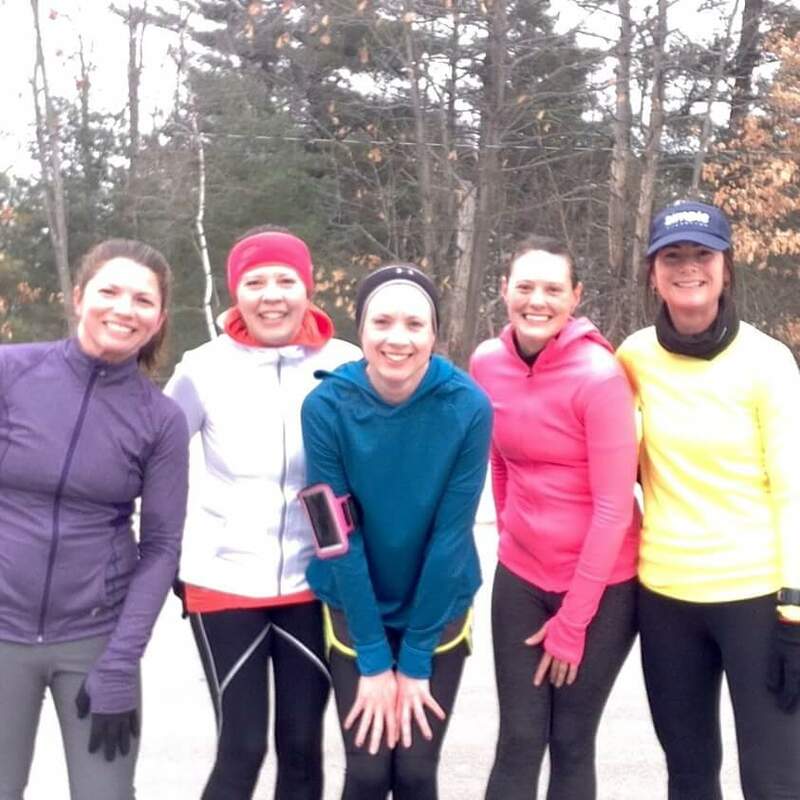 But I was meeting some MRTT friends in Goffstown for our Sunday Runday. We got in our 5 miles by the 5th and have the obligatory group runfie to prove it. We dodged cars, ice, and snowbanks. We grumbled about our numb fingers and toes, and about the lack of sun. We told each other there would come a boiling hot summer day when we might miss these cold temps. But nobody really believes this (even though it’s true). And we laughed and shared parenting stories and discussed our favorite workout videos and yoga instructors. In the end we had that glorious feeling that comes with knowing we got our run in. We had the sore legs and flow of endorphins to take with us as we returned to our families and went about our Sunday plans. It was the perfect way to kick off this new month, and I’m so grateful to have had the motivation of a group run to get me out there. And to all my runner friends, whatever your March plans may be I wish you a happy month with lots of running! Great post Mary Beth! Loved the Sunday meet up too! This was great! I loved this and felt a little teary eyed on that last paragraph. This was the first group run for me and as I said I felt like I was going on a date! It was exactly what I needed and I am looking forward to many more! Keep up the writing Mary Beth!